So this is the second of Reaper’s Learn to Paint Kit series. I wrote some thoughts on the first one here, and when I saw this one come out, I decided to get it for the collection of paints, the case to use to transport miniatures, and for the Reaper Bones miniatures included. So the first thing to mention is that it has a good selection of colors including a Red, Yellow, and Blue so that you should be able to mix any color that you want and don’t have1. It also has two brushes, these are at least normally different sizes from the first one, and there is one empty bottle to use as a water bottle. Between all of these things the combination of this and the first Learn to Paint Kit should give you a very good starting base for any miniature painting you might want to do. While this one by itself is probably sufficient to get you started. The instruction manual for this one is a 28 page mat booklet instead of the glossy booklet that you got with the Core Skills version, and it is laid out similarly. We get the most information on the first miniature, and then significantly less on the other two. The miniature that they gave the most information for is probably my least favorite of the three. 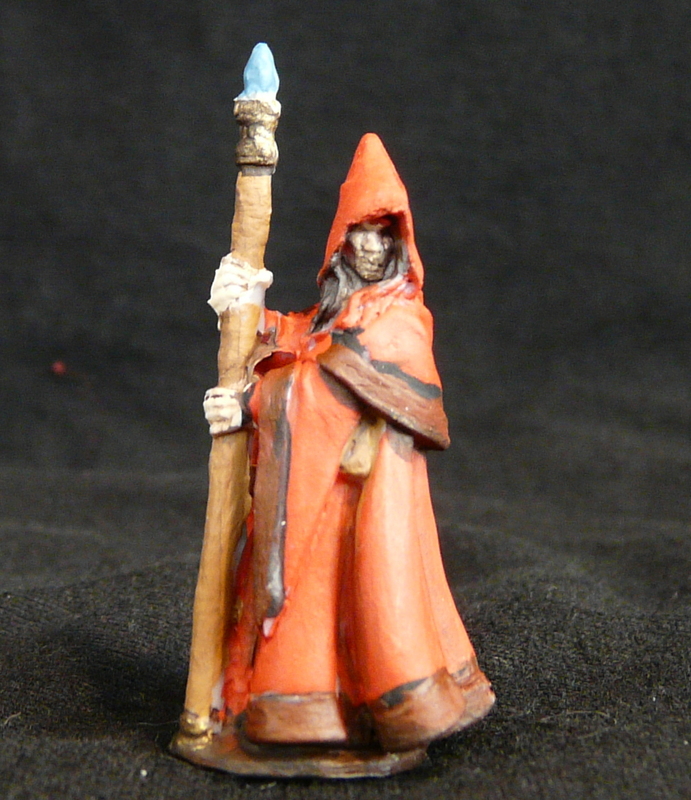 Anirion is a robed wizard and in general is a fine miniature, I just think that from a learning kit point of view, the staff and hood are problematic especially if your hands are shaky while painting. The other two miniatures are fine. I got the expected ones in this set2 Ingrid and Hajad. Hajad is my favorite of the three. The lesson in this kit is all about layering colors starting with a base coat, and then one or two layers of watered down darker mixtures to add shadows. You then follow that with one or two layers of a watered down lighter color for where the light hits and you finish them off with a glaze of watered down base coat to help blend the highlight and shadow layers so that there are no harsh transitions. The booklet also contains some bonus tips about painting eyes, drybrushing, and images of the paint on text to show the different levels of coverage that each paint gets as well as what they look like with differing amounts of paint and water. We also get a glossary of terms, I am not sure how useful these are, but at least there is only a page of them. Anyway here is how Anirion turned out.